The Ultra 95 Ceiling Mount frees up precious wall space by mounting securely from the ceiling. It’s an excellent choice for medical operating rooms, dental operatories, and industrial/manufacturing applications. This arm swivels 360° at the ceiling and provides 180° of screen tilt so you can position your monitor to the ideal viewing angle. Two joints offer additional monitor angle adjustments, adjust easily, and lock securely into position. 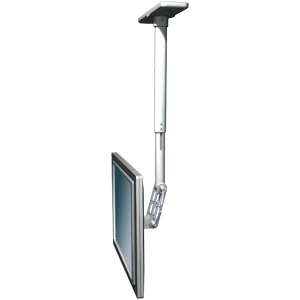 This telescoping ceiling mount extends 13.5” to 32” (34.3 to 81.3 cm), so you can quickly position your monitor to exactly the height you need. The model shown is mounted using a 12″ (30.5 cm) extension pipe. It is secured to a stud in the ceiling using four countersunk wood screws that are provided with the unit. Ceiling extension pipes are available in 12” (30.5 cm) and 24” (61 cm). Machined out of aircraft quality aluminum, the Ultra 95 Ceiling Mount is powder coated gloss white for a durable, lasting finish. Hand assembly ensures that a quality product is shipped to you.